Yvonne of Quilting Jetgirl hosts and annual Planning Party. She excels at organization, and is a good motivator, encouraging me to pull myself together and be more mindful about about my intentions for the coming year. I expect to have more success in accomplishing my goals if I take a minimalist approach. 1. Pick up where I've left off. I have a great many projects in various stages of completion. I'd free up some sewing room and mental space by getting them out of the way. 2. Pick a few commitments so that they stay fun and manageable. 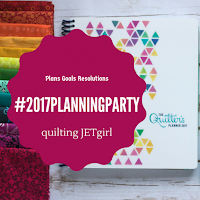 I'll be participating in the Gridsters bee organized by Elizabeth of OPQuilt, continuing my 10 Sewing Notions You Need to Know About series, and joining any blog hops FQS may ask me to join in the coming year (because I've enjoyed working with them immensely). I'm paring down my in-person guild attendance to ABQMQG. While I have enjoyed larger daytime groups in the past, it's become too difficult to tote the kids along and still participate, and far too large of an investment to hire a decent sitter on a regular basis. 3. Take care of myself. This isn't really as posh as it sounds. There won't be any cucumbers on my eyes or anything like that (unfortunately). Rather, I'm making a promise to myself to go take a nap or grab a bite to eat instead of being in denial that I actually need to pause what I'm doing every once in a while. I suspect this will results in less mental lapses and a decreased chance of my body staging a full-fledged revolt against my neglect. Sounds like a good plan, Afton. I plan on making a plan next week some time. My sewing room is so full that I can't even get in there to work on stuff so gotta figure something out there. Happy 2017! I make plans and have goals at the beginning or a New Year, but I tend to use it more as a guideline! Well made plans never go as they should. Number 3 is also on my list for 2017 planning party list! It's very easy to overlook yourself...it will be good for you and everyone around you too! I like your plans, Afton. I think it is all too easy to neglect our own self care. I hope you have a very Merry Christmas, wonderful 2017, and thanks so much for linking up! Wait! Is it time to plan for 2017? I just got used to writing 2016 everywhere. I like your goals, your ideas and am thrilled to be bee-ing with you in the Gridsters. I like this short, simple list!